Still not convinced? Well read on!! So why Emerald Talisman? This item gives 100 health, a whopping 50 Magic Power, an amazing 15 hp5, and lastly a measly +6 mp5. These four attributes are nothing, but beneficial to your asset because most harass is due to ranged attacks / magic. The 50 magic protection will definitely let you get in without much trouble. The 15 hp5 > pots because 15 hp5 is permanent whereas pots are a temporary source of health regeneration. The moment you hit 770 gold you need to go back and finish the Stone of Gaia. If you happen to have extra 50 or 100 gold, grab some wards to prevent jungle or other lanes from interfering. Now why Shoe of Focus and Breastplate of Valor? These are what give you the short cooldowns and major mana boost. Once I get these 2 items I rarely have to go back to base. I am constantly ganking for all lanes and when I switch lanes my mana and health are back up. The focus of this build is the cooldown reduction. Now the rest is preference. I personally like Hide of the Urchin This items gives +45 to both protection and Health + Mana. This items only further reinforces that you won't die. I am in the fight 100% of the time and I get under 5 deaths and most games I never die. Is there a pesky Apollo or Loki? Don't worry solve your issues with Midgardian Mail. This shiny armor makes it so that they slow down and allows you to re-position stress free. If their team is heavy auto-attack champs I will tend to get this before Hide of the Urchin. Sovereignty. Do you even know what this word means? It means supreme power or authority. If you want to rule the map with Sovereignty you need to grab this item. The aura that this item gives is invaluable. I usually grab this item as a 4th or 5th if I see allies struggling in the survivability department. Is there a Anubis or Poseidon blowing your health bar off? It's all good just grab Bulwark of Hope. This bad boy gives you +60 Magic Protection and 450 Health as well as a passive that mitigates 50% of the damage when you are less than 25% HP. This is super useful for those champs that love those last minute ulties that catch you while you're running with your pants down. You will be around your opponents about 90% of the time and to further increase physical protection while dealing damage you grab Mystical Mail. This item is seriously underrated. That passive that deals 40 damage per second is like a ghost. Many people don't see that while you're constantly sticking close to your enemy you are consistently blowing off 40 damage per second. Most fights last 7-8 seconds late games and maybe even longer if there are complications. Well you do the math :) If you decide to grab this items right after core, the damage and protection is well worth it. Blink: This is where it separates the men from the boys. You have one of the nastiest engage / initiations. You have two choices depending on their setup. Scenario 1: If you see a Mage or Hunter standing in the front and a warrior or guardian chillin behind. You need to blink on top and ultimate. This will cause a panic and many people will try to run away from the ultimate. Due to this engagement the enemy team will separate. This will cause a 3v5 or a 2v5. Then when they decide to re-group amidst the chaos you can use Frost Breath to freeze the carries or their bruisers to disengage them from your carries. Scenario 2: If you see someone lingering behind like a dummy don't be so hesitant to blink right in and freeze then wall to prevent escape. Enfeebling Curse: Alright this item is underrated too. This item can be used while engaging or used to disengage. The radius of this item is HUGE. 55 FT radius!!! Also the added effect of the Attack Speed slow is big as well. For some this can be life saving. I encourage this item for its major utility. I usually use this after my ultimate to catch the stragglers. Description: All of Ymir's abilities that affect enemies apply a debuff to the enemy called Frostbite. All of Ymir's basic melee strikes against a target afflicted by Frostbite do 100% more damage. My description: Wow! What a powerful skill. This skill is what gives me most of my kills. When I am laning my combo is: Frost Breath -> step forward then auto attack -> Glacial Strike -> Step forward auto attack. Do not forget to auto-attack in between skills to utilize the passive to its fullest potential. Every hit counts and every hit is a potential kill. Description: Ymir summons a wall of ice out of the ground that players movement. My description: Alright this skill affects you, your allies, and your enemies. To really make Ymir one of the best supports is by utilizing this skill at its max potential. This skill can be used to create 3v5, 2v5, 1v1 or 2v1. The range of this skill is absurd as well. The angle of this skill must be utilized well too. Sometimes a straight line wall is alright, but if you create an angled wall to create a wedge against a wall. This will create more distance that the opponent must run to ensure his safety. If you use this skill incorrectly you can let potential kills run away or worse you can end up killing your own teammates by trapping them in. Use this skill well and it will forever be the best asset. Description: Ymir smashes his club, doing damage to all enemies in front of him and slowing them. Description: Ymir uses his breath to freeze his enemies in blocks of ice, doing damage and stunning them. My description: Everyone's favorite skill. This skill is absolutely ridiculous. At max level the stun duration is 2.25s. This gives you and your team more than enough time to pummel them to death. Please remember to freeze then re-position yourself closer or in between them and the rest of the team to ensure blockage. I cannot stress this enough. My favorite thing to do in lane is to let the minions push then bait myself a bit then freeze them while they are near my minions. They take tremendous minion damage as well as damage from your frostbite. This almost always ensures first blood lol. This skill does have a high cooldown so don't go and waste your Dentyne Ice breath on 1 person unless you absolutely must. It is imperative that you hit 3 or more targets to fully utilize the skill. Description: Ymir begins to freeze the air around him, causing shards of ice to grow on his back and slowing enemies. After a 3s channel, Ymir erupts out of his frozen state, causing shards of ice to do damage to all enemies in his range. Cancelling the skill decreases the damage. My description: I love this ultimate. Reason? Well it makes everyone run away from you and use their escape abilities. Hahaha. Also the damage :) If you really want to break your opponents morale just blink in the middle and ultimate to separate the group. One of the best moments is using your ultimate and watching their health bars fly off. If a team is smart they'll try to kill you if you're low health to cancel the entire ultimate. So yeah one thing to note if you die during the channeling and you don't cancel it before you die. The damage done will be zero. SO if you're near death and are about to die just cancel right before you die. In all of these scenarios this allows your team to come in and do the rest of the work as their skills and ultimates spent on you will be exhausted. Lane: Skill 3 -> re-position forward + auto-attack -> Skill 2 -> re-position + auto-attack -> fall back then rinse and repeat or go all in if they're about to die. In the jungle: Skill 1 to trap them -> auto-attack -> Skill 3 as the wall expires -> reposition forward + auto-attack -> Skill 2 -> re-position + auto-attack -> rinse and repeat. Late game: Blink -> Ultimate -> Enfeebling Curse -> Skill 3 carries -> auto attack -> disengage for carries if needed with Skill 1 -> Skill 2 on carries. Well hopefully my skill build/item build and theory has compelled you to try my build. It would be nice to get some constructive criticism and thanks for reading my guide. Hello and I'm here to give you that constructive criticism. The main game mode is Conquest and that's the one most people struggle with. So let's focus on that for a bit. You don't have Watcher's Gift for a starter item and THAT'S a must. You also want to grab Hand of the Gods so you can secure the Gold Fury and Fire Giant. I only see a few matches played with Ymir so I'm under the assumption that you need more work with him. You do lack good bb coding though I do see some in it which makes me happy. I do like the skill order you chosen though I completely disagree on the Stone of Gaia start. I'm not sure if you're level 30 yet but if you were I'd cringe to have you as my support and I'm sure people would give you lip for starting with those items. If you aren't level 30 then don't bother making a guide since you yourself are learning the game still. I'm just here to help you because I want you to have success with this guide. If you need a base guide to work off of use mine. Best of Luck. I also think the title "The Popsicle King" would be funny. 77347 TheZodiacWolf Hello and I'm here to give you that constructive criticism. The main game mode is Conquest and that's the one most people struggle with. So let's focus on that for a bit. You don't have [[watcher's gift]] for a starter item and THAT'S a must. You also want to grab [[hand Of the Gods]] so you can secure the [color=#ffff00]Gold Fury[/color] and [color=#ff0000]Fire Giant[/color]. 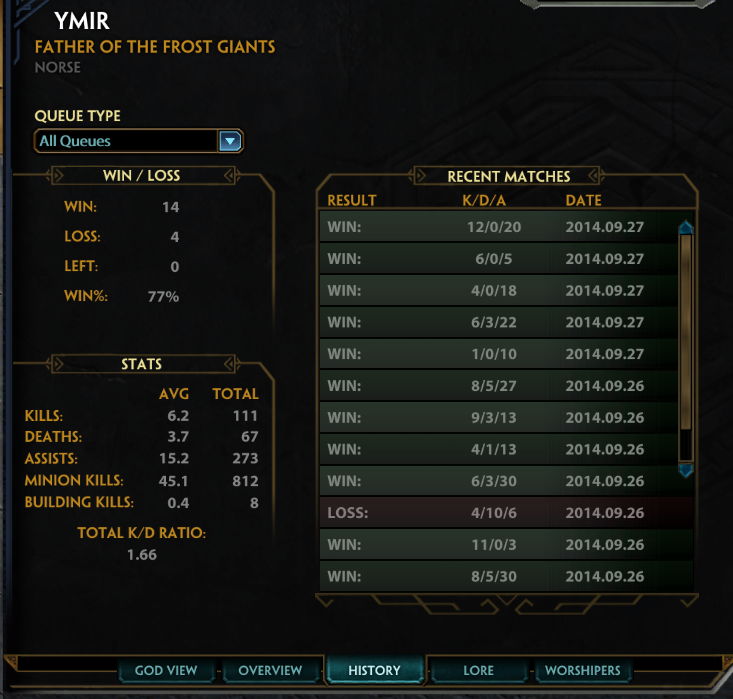 I only see a few matches played with [[Ymir]] so I'm under the assumption that you need more work with him. You do lack good bb coding though I do see some in it which makes me happy. I do like the skill order you chosen though I completely disagree on the [[stone of gaia]] start. I'm not sure if you're level 30 yet but if you were I'd cringe to have you as my support and I'm sure people would give you lip for starting with those items. If you aren't level 30 then don't bother making a guide since you yourself are learning the game still. I'm just here to help you because I want you to have success with this guide. If you need a base guide to work off of use mine. Best of Luck. I also think the title "The Popsicle King" would be funny.